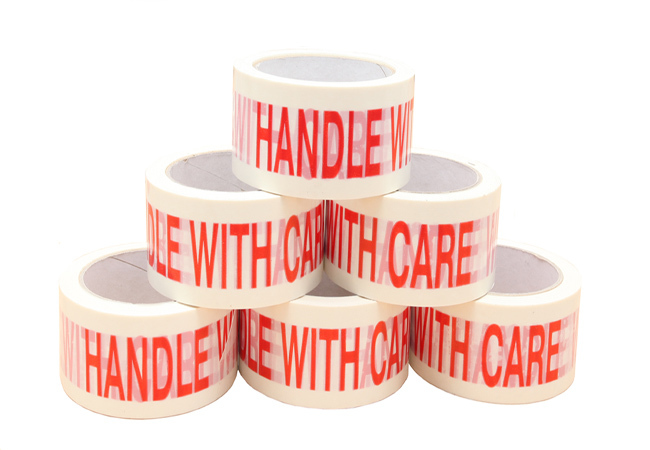 This handle with care packing tape is ideal for sealing parcels while calling for extra attention in handling them. It is a premium vinyl adhesive tape, durable and low noise, ideal for shipped items or when moving house. Our HANDLE WITH CARE self adhesive warning tape is the best way to ensure that your products are handled with extra attention, helping avoid the risk of damage while they are being shipped or stored. In addition our warning tape offers an ideal solution to monitoring your packages because, being an excellent carton sealing tape, it immediately reveals if your boxes have been tampered with. Made from high quality vinyl with a strong and durable adhesive, this packing tape has its unmistakable warning printed in red on a white background to send out its unmistakable message. Low-noise to work with, our handle with care tape comes in packs of six 50mm x 66m rolls and can be used with our tape dispenser or tape gun for quick and easy application. It’s ideal for sticking down boxes in a house move, and whether in the warehouse or at home this packaging tape will save you time and money because you don’t have to buy and attach extra warning labels. An added bonus is that all our warning tapes are low noise, making for a more pleasant working area! You go to a lot of trouble to pack your parcels well. Now make sure your products and possessions are given the respect and consideration they deserve by sealing them with our HANDLE WITH CARE packing warning tape.